It’s not often that I’m eating salad, but when I do you can bet it’s going to be grilled, and you can bet it’s going to include steak. The thought of grilling lettuce might sound a little weird, but trust me on this one, you’ll thank me after you try it. The char to the surface of the lettuce brings in a layer of flavor that is incredibly appealing. This salad has proved to be an all-time favorite around my house, and you can take it in many directions. Don’t like blue cheese? No sweat, sub in feta. Love ranch dressing? That’s awesome with this salad as well so let it rip. Another added benefit to this is that like some of my other recipes, it’s also great with leftover steak. Steak isn’t like stew that actually tastes better the next day, so finding creative ways to use it is key. Serves: 4 | Prep time: 10 mins. | Cook time: 10 mins. Step 1: Light grill and set up for direct high heat. Step 2: Mix ingredients for seasoning together. Coat both sides of steak with seasoning. You can use whatever seasoning you like, but I like to keep it simple with my steak seasoning so the beef flavor shines through. Step 3: Cook steaks over direct heat, for 3 minutes on each side. 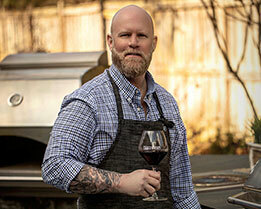 Rotate steaks 90 degrees after 90 seconds on each side, remove from grill and let rest. This will get you a nice medium rare on a thin steak. If you like your steak cooked a bit more leave it over the heat for a bit more time. 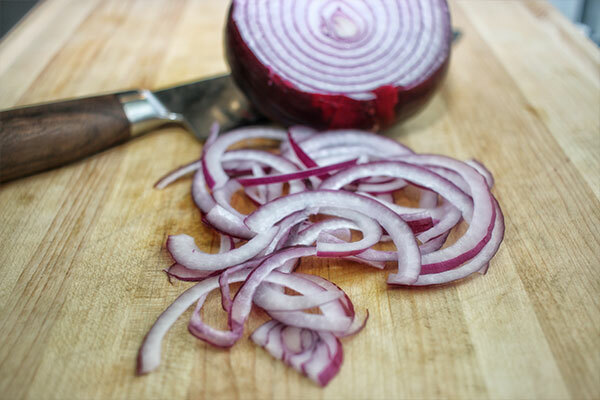 Step 4: Slice 1/2 of a medium red onion as thin as possible, set aside. A sharp knife is a must for these thin slices. Step 5: Slice grape tomatoes in half, set aside. Step 6: Remove any limp leaves from each head of Romaine and trim the ends. Rinse, clean, and dry the lettuce. Step 7: Slice hard boiled eggs. I use an egg slicer for convenience and presentation, but if you don’t have one you can use a sharp knife. For the few bucks, I think an egg slicer is worth it—they work well with strawberries too. Step 8: Slice lettuce in half lengthwise. 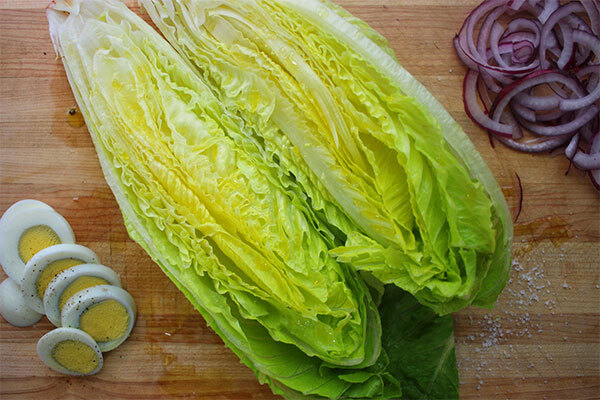 Drizzle the cut side of lettuce with olive oil and sprinkle with salt. Step 9: Put lettuce on the grill over direct high heat, searing for 2 minutes, rotating 90 degrees every 30 seconds. Step 10: Remove lettuce from grill and plate, seared side up. Step 11: Thinly slice steak in 1/4 inch slices. 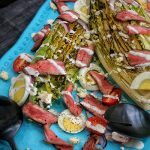 Step 12: To plated lettuce, add sliced red onions, sliced eggs, sliced grape tomatoes, sliced steak, crumbled blue cheese, and dressing. Top with freshly ground black pepper, dressing of your choice, and serve. Light grill and set up for direct high heat. Mix seasoning ingredients together and coat both sides of steak with steak seasoning. Cook steaks over direct heat, for 3 minutes on each side. 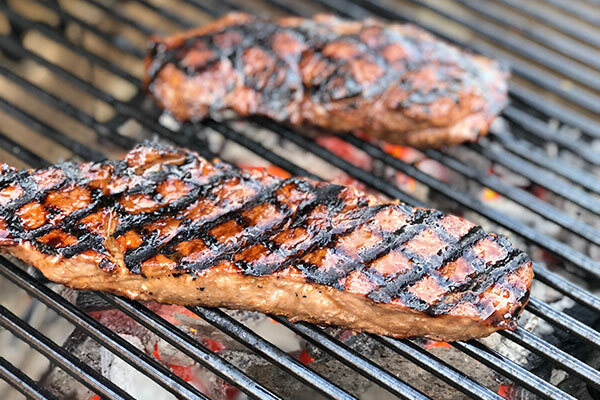 Rotate steaks 90 degrees after 90 seconds on each side, remove from grill, and let rest. Slice 1/2 of a medium red onion as thin as possible, set aside. Slice grape tomatoes in half, set aside. Remove any limp leaves from each head of Romaine and trim the end. Rinse, clean, and dry the lettuce. Slice lettuce in half lengthwise. Drizzle cut side of lettuce with olive oil and sprinkle with salt. Put lettuce on grill over direct high heat searing for 2 minutes, rotating 90 degrees every 30 seconds. Remove lettuce from grill and plate, seared side up. 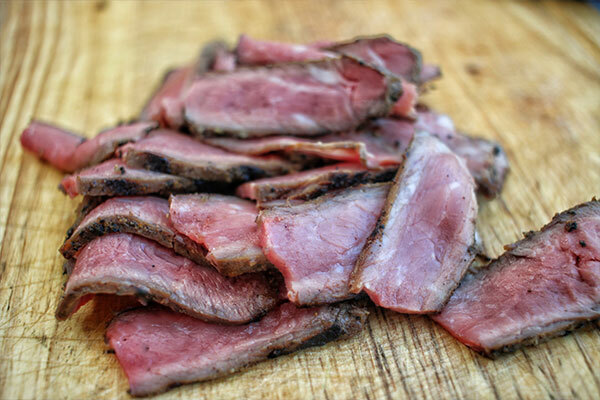 Thinly slice steak in 1/4 inch slices. 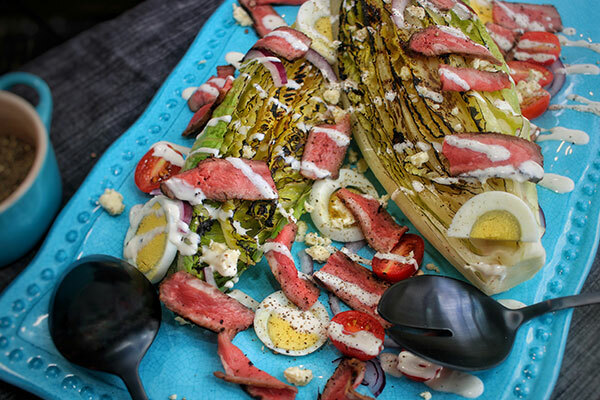 To lettuce, add sliced red onions, sliced eggs, sliced grape tomatoes, sliced steak, crumbled blue cheese, and dressing. Top with freshly ground black pepper, dressing, and serve.